We walked wherever we could in Paris, although we also used the wonderful Metro and RER trains. On our second day, we left our hotel and stopped at the Statue of Liberty – a smaller replica of the statue in New York Harbour. It is a quarter of the size of the original and stands at the southern end of the Île aux Cygnes, an island on the Seine. The statue stands next to a bridge crossing the island. I couldn’t help notice the irony that homeless people were living under this bridge, right next to this quarter-sized symbol of freedom. 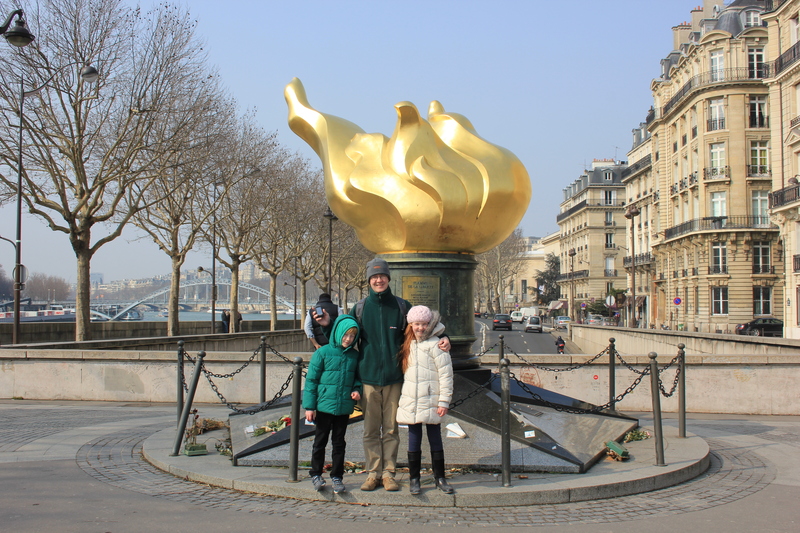 We crossed the river to the right bank, and walked up to the Flamme de la Liberté, a full sized replica of the torch carried by the New York Statue of Liberty. It was placed here in 1987 to celebrate 100 years of the International Herald Tribune, but is now more associated with the death of Diana, Princess of Wales. It sits at one end of the tunnel where she died. There were photographs, flowers and messages at the site. We cut away from the Seine at this point and headed over to the Arc de Triomphe, although one of our party was feeling a little tired and needed a Parisian foot massage on the way. This provided energy enough to make it to a cafe for lunch. We walked off the tourist track, stopping at a cafe I don’t know where. We had to converse in French. We ate with workmen; locals; anyone but tourists. It felt good – as if we were seeing some of the real Paris and not just the tourist gloss. We paid our bill, left and worked our way up to the Arc de Triomphe. Our intention was then to walk over to Sacré Coeur, a distance of only two to three miles or so, but time was getting on and feet were getting tired again, so we took the Metro. 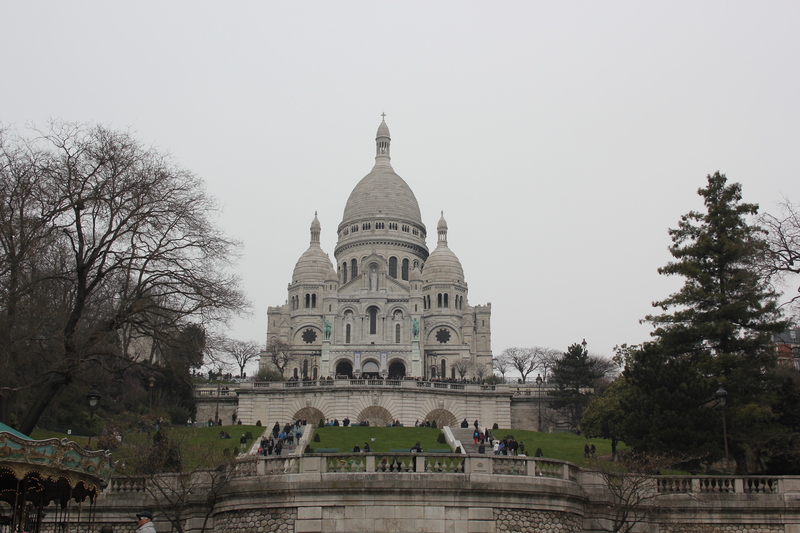 Sacré Coeur was busy, and the smog was back, impeding the views which might otherwise be afforded from its dome. We decided not to enter, but instead went to the Place du Tertre, just to the west. Portrait painters and caricature artists tried to sell us their services with varying degrees of politeness. Most were friendly and pleasant. One was not. “What’s your problem? Time or money?” he asked. The way he asked it conveyed an absolute certainty that he was going to have a smart response to whichever answer we gave. In fact, our problem was neither time nor money. It was him (but I didn’t tell him that). We ended up getting a coffee and watching people sit for their portraits. Perhaps it was a bad day, but none of the portraits looked very much like their subjects. One particular artist seemed to be sketching Scarlett Johansson. His poor subject (who looked nothing like her) sat patiently, blind to what was being sketched out and waiting for her likeness to be revealed. We left before the grand unveiling. To this day I wonder what she thought, and whether the painting now hangs on her wall. If you ever happen to be bidding on eBay for an original picture of Scarlett Johansson, cancel your bid if the picture shows her wearing a green scarf and the artist has a French looking name. It’s not her. Trust me. 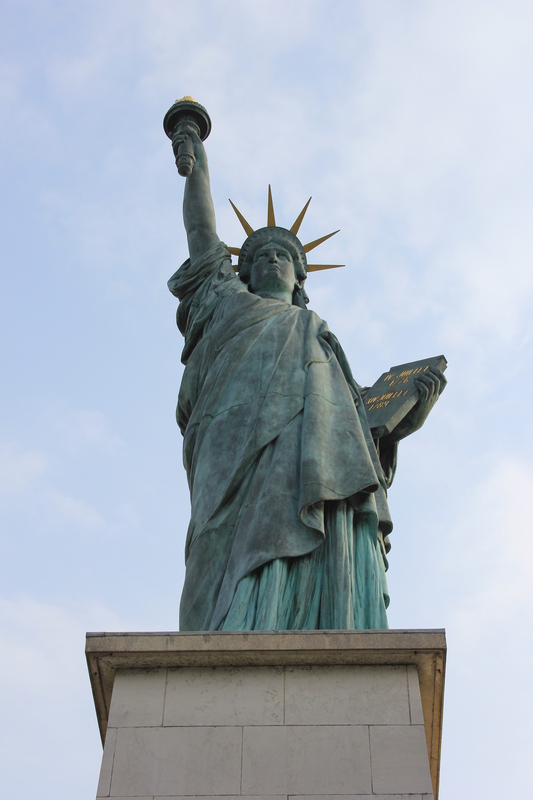 This entry was posted in France and tagged liberty flame, paris, portrait, sacre coeur, statue of liberty, travel. Bookmark the permalink. What do you order for lunch in a French cafe when you eat with workmen, locals, and anyone but tourists? Whatever you know the words for!